Soldiers of the 7 Division of the Nigerian Army in Maiduguri, Borno State, today gunned down a female suicide bomber trying to enter the barracks.The soldiers watched in horror as the bomb strapped on her body exploded. 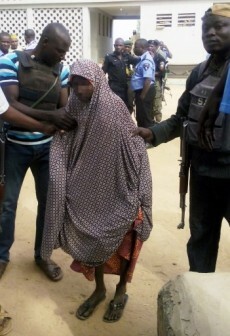 According to Daily Trust, the suicide bomber described as a tall girl in red hijab approached the gate around 6:00 am, defying warnings by soldiers to stop and identify herself. ‘You are stupid also. I will not stop.’ At that stage, I took cover in readiness for anything. I knew she must be on a rough mission but I was thinking they were many. “That soldier warned her again that he would shoot if she refused to stop. The conversation was in Hausa. Meanwhile, she was still approaching us. Then she replied him; “shoot me, I know I will die just once.’ He fired at her once but he could not get her. Another soldier shot her on the leg and she fell. Even while on ground, she was still crawling toward us. The woman approached the barracks around 7:00 am and headed towards the gates.Military guards at the gates shouted at her to stop for security checks but she ignored them and continued walking towards the gates.She continued walking with her handbag slung on her shoulder‎, despite repeated shouts from the soldiers asking her stop.